When you look at a straw hat, do you see a fashion accessory, or do you find the weave and texture translating into geometric patterns in your mind? For Tory Birch, it was the latter. On a trip to a souk in Marrakech, she found a hand-braided hat that became the inspiration for a conversation print used on tunics and swimsuits in her resort collection. Travel is widely acknowledged as an enduring source of inspiration for designers. Kim Jones, former artistic director of Louis Vuitton, went so far as to describe his spirit of adventure as “the lifeblood of his creativity” in a recent interview with The Telegraph. He based almost all of his menswear collections on a different city - something which harks back to the design house’s origins in travel with the iconic steamer trunk. After several trips to Jaipur, Jones translated the colourful fabrics, maharaja costumes and grand palaces of India into a modern and wearable collection for the international market. Mulberry is known as an English heritage brand and the AW18 collection played upon the nation’s love for the seaside, tea parties and aristocracy. Held in Princess Diana’s ancestral family home, Johnny Coco took inspiration from My Fair Lady and Royal Ascot – a national institution and centrepiece of the British social calendar. As he eloquently puts it, “Modernity always needs roots in the past”. From Turkish Iznik tiles, Azerbaijani rugs and Burmese headdresses, to English country gardens and the fabrics of Rajasthan, ideas can be sparked from the most unexpected and incidental of places. But it is not always visual or tangible aspects that inspire designers. After seeing a travelling photography exhibition at London’s National Maritime Museum, Thea Bregazzi and Justin Thornton became inspired by the story of the Haenyeo of Jeju. The people of this South Korean island live in a matriarchal society where the women are the chief earners. For centuries, girls have been trained from the age of 11 to free dive as deep as 10 metres (holding their breath for up to three minutes) to harvest the ocean floor for seafood. They meet in the morning to sing songs that celebrate the sea and the earth, then before entering the water they pray to Jamsugut, goddess of the sea, for protection. These independent and determined women continue to dive for their livelihood well into their eighties, while the men stay at home and take care of the children. Reflecting the haenyeo’s style, the Preen by Thornton Bregazzi AW18 collection has a utilitarian design and understated glamour to it. Combining neoprene with tulle and silk mirrors the elegant way that they layer their wetsuits with lace tops and blouses. But beyond the aesthetics, the design duo wanted to imbue the character of the island and strong cultural identity of these inspiring women into the show. Their society has contributed to the advancement of women’s status in the community and promoted environmental sustainability thanks to their eco-friendly methods and management of fishing practices. Justin Thornton describes them as “eco-warriors” - a reference that materialised into a feminist collection with an environmental feel. The haenyeo are a valued part of Jeju’s history but after industrialisation and with better educational opportunities available, the practice is dying out. But capturing their cultural heritage through photography, literature and fashion, keeps the last vestiges of this sea-diving community alive. Inspiration such as these women - who epitomise courage and perseverance - provide an enduring muse for feminists, environmentalists and, of course, designers, the world over. José Jeuland discovered the haenyeo whilst doing some research on the island. View his striking imagery here. 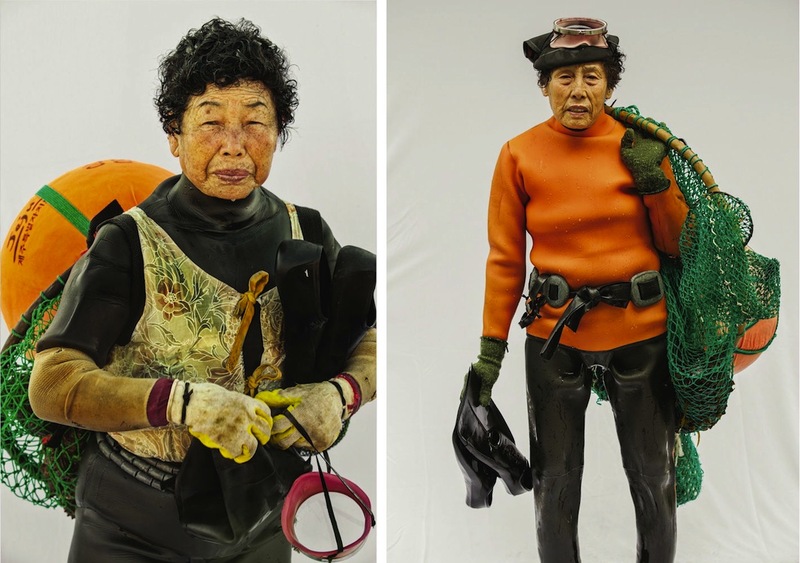 Photographer Hyung S. Kim also took photos of the divers as they emerged from the water over a two year period. See how he captured their innate beauty here.